Keoladeo Ghana National Park is situated in the Bharatpur district of Rajasthan, India. If you are in Rajasthan and looking for a place which can make your trip memorable then this is the ultimate destination for you. You might be never heard about “Keoladeo National Park” but if you are from India then definitely you heard about “Bharatpur Bird Sanctuary“. This park is also known as Keoladeo National Park or Bharatpur Bird Sanctuary. It is one of the biggest bird sanctuaries of India. Every year during the winter season, thousands of tourist visit here to explore this wonderful national park. The name Keoladeo comes from the Keoladeo Temple of Lord Shiva. The park was the biggest bird hunting ground during the British era. August To February is the best time to visit Keoladeo National Park. If you want to watch migratory birds then October to February is the season when the park will be full of thousands of Siberian migratory birds. During this period you can easily spot some fantabulous and most beautiful birds. If are fond of clicking pictures then this is the paradise for you. August to November is the breeding season for resident birds. Try to avoid visiting during afternoon hours during summers. Guide charges are compulsory for the visitor’s group of minimum 10 persons. This is a man-made marshland spread over 29 square kilometers area in Bharatpur of Rajasthan. The whole reserve consists of savanna, green forest, and wetland. It was built 250 years ago. During that period, every year the surrounding area of this park was suffered by a heavy flood. To overcome this problem Maharaja Suraj Mal had constructed the Ajan Bund on the confluence of Banganga and Gambhir river. The name “Keoladeo” came from the Shiva temple present inside this wildlife sanctuary. It is the abode of more than 350 species of birds. The wetland is the natural habitat for around 50 species of fishes and 7 species of turtles. Apart from fishes, turtles and amphibian species you can see reptiles and wild animals like Nilgai, Sambar, Deer, Jungle Cat, Fishing Cat, Otter, Hyenas, Indian Mongoose, Cobras, Lizards etc. This more than 250 years old sanctuary is one of the UNESCO’s world heritage sites present in India. It was one of the biggest hunting ground for maharajas of Bharatpur and British officials before India’s independence. In the year 1938, then Governor-General of India Lord Linlithgow killed over 4,273 birds which include birds like mallards and teals. Maharaja of Bharatpur had retained shooting rights until the year 1972. This bird sanctuary was established on 13 March 1976. In the Wetland Convention organized in October 1981, it was declared as a Ramsar site. The government of India designated it as a national park on 10 March 1982. The national park was declared as a World Heritage Site in the year 1985. In our suggestion, Keoladeo Ghana National Park is an ultimate destination for birdwatchers. 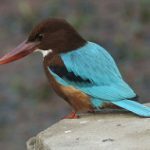 How To Reach Keoladeo Ghana National Park? By Road: This sanctuary is well connected by road with all the major cities of Rajasthan and Delhi. You can hire private taxis from Jaipur, Agra and Delhi to reach here. The nearest big city is Agra. The park is located at the distance of 55 kilometers from the city of Tajmahal, Agra. Bharatpur sanctuary is situated at the distance of 222 kilometers from Delhi. It takes around 4 hours to reach here by road via Yamuna Express highway. If you are coming from Jaipur then you need to travel 185 kilometers. This journey required around 3 and half hours. By Railway: The nearest railway station is Bharatpur junction and it is situated at the distance of 5.4 kilometers from the park. You can hire a taxi from railway station to reach here. By Airport: The nearest airport is Jaipur international airport. This airport is connected with all the major cities of India. It is located at the distance of 186 kilometers from the sanctuary.